Erik Collins of BAKERSFIELD, CA was named to the Dean's List at PR University. The text in all caps obviously stands out from the rest of the text and makes the student's hometown look out of place. Thankfully, there's an easy way to change the case of text inside your spreadsheet. The first thing you'll want to do is create an empty column in your spreadsheet. Next, you'll want to enter a simple formula into the empty cell to convert the text to your desired case. =PROPER - Converts all text to title case by capitalizing the first letter of each word. 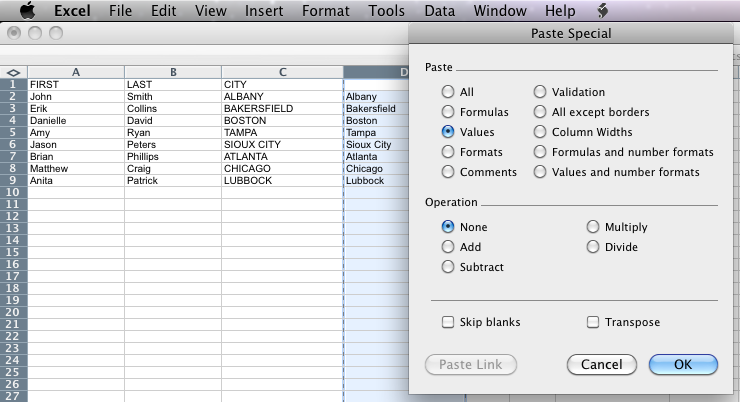 To turn the entire column into proper case we'll simply copy and paste the formula into every cell in the column. Here you'll notice that the contents of column D are the title case version of column C.
Right now, even though we see Albany in cell D2 and Bakersfield in cell D3, the actual contents of these cells are =PROPER D2 and =PROPER D3. The last thing we will want to do is insert the actual text into these cells. To do this, we'll highlight the column and copy it's contents. We'll then want to paste this text back into the same column (or another empty column in our spreadsheet) by using Excel's Paste Special feature. To do this, we'll highlight the column we want to paste our text into, and right-click. There you'll want to choose Paste Special. This will open up a box that will prompt you to choose the format of the text you'd like to paste. Here you will select the Values option. This will paste the actual converted text into your spreadsheet instead of the title case formula.In the image below, we've retitled our converted column of cities HOMETOWN and it will now flow with the rest of the text in our hometowner. For more details about copying and pasting text values in your spreadsheet, check out this guide, or contact a readMedia editor at (800) 552-2194 or customerservice@readmedia.com.